Do you regret some of the financial decisions you’ve made in your life and want to see your kids go down a different path & learn from your mistakes so they can make better decisions with their finances? My husband and I entered marriage in debt from student loans & credit cards, gaining even more debt during the first 8 years of our marriage with more student loans & credit cards debt as we struggled on one income thru school & having a baby. That time of struggling with finances & debt hanging over our heads was a stressful time in our marriage when you’re living paycheck to paycheck & trying to pay down bills without any savings. We also didn’t have a good plan on how to get out of that cycle until we finally took a Dave Ramsey Financial Peace University class to help us \ to work thru all of our finance issues. With that solid plan of how to tackle our finances, we were able to work hard for several years to pay down all of our debt & become debt free. Becoming debt free was a feeling of freedom to finally not have that burden and we could begin focusing on our savings. Due to our experiences, it’s been important to us that we teach our kids from a young age how to manage their money so they can hopefully start off on a better foot than we did. A few years ago, we set up our current system to get our kids involved in helping out with jobs/chores around the house, but also provide opportunities for them to earn an allowance. By having them earn an allowance, this then gives them the opportunity to manage their money. I think this system works well and you could start this even with preschool age (we started it when my younger daughter was about 4 years old). 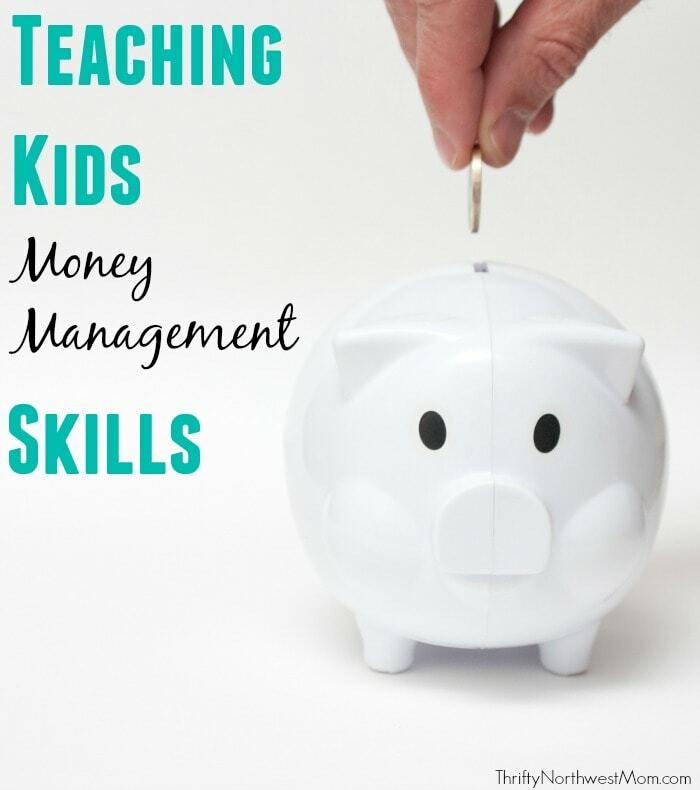 The types of jobs they do will vary with their age, but starting as early as possible in giving them a way to earn money is a great way to teach them how to manage their money at a young age. It’s much easier to learn money lessons when you’re a kid & realizing that it’s better to save than to spend all your money. Having a “chore” system will work differently in every house as you have to find what works best for you & your family. I’m just going to share how it works at our house if you’re needing ideas of where to start. As I mentioned, our girls do earn an allowance, but there are certain jobs that are part of being a member of the family. We do not pay our girls to do all their jobs as we all “work” around the house together to get things done. The way we work it is that you earn $.50 per year of age, so my 12 year old earns $6/wk & my 10 year old earns $5/wk. We call our chore chart a “Responsibility Chart“ so we focus on the responsibilities that each of us are in charge of to keep our house running smoothly. I think it’s just a positive way for your kids to think about it as responsibilities they have around the house. We also have added some behaviors on there as well, as those are their responsibility as well – be respectful, listen well, etc. At the end of the week (our system runs Mon – Sun), we then sit down & go thru the charts & pay out the money so it’s all at one time & then they will divide their money into the envelopes that I will share below. Make sure to print off your own Responsibility Chart – this is a free printable for you to use. We have a version that is editable so you can customize it for your child and their responsibilities at home. Family Duties – These are daily duties such as make bed, brush teeth, clean their place at the table, dirty clothes in hamper, shoes in closet drawers, & more. Regular / Weekly/Semi-Weekly Duties – These are duties that don’t necessarily happen every day, but when needed. Tasks such as bringing down dirty laundry, putting folded laundry away, clean sinks, and more. They may not be home to do some of these tasks if we have a nighttime activity after school, so we have it under this category to do it at least several times a week. Bonus Section – This is where they can choose to earn extra money by doing additional jobs around the house/in the yard, etc & we keep track of that money here (so we don’t have to pay out that money right then but it’s all kept on the chart for the week). Fines Section – This is where we keep track of any fines for behavior that is expected – not completing family duties, not being respectful, etc. We will also circle the day that a job did not get finished in any of the top 2 sections as another way to keep track of it and that will also be a fine. Fines are $.25 typically – when they don’t complete a job or don’t do it correctly. As I said, that’s just what works for us – we’d love to hear how you do jobs/chores with your kids and at what age you started. We have 3 envelopes that our daughters keep their money in that they earn from their jobs & extra work. They are labeled Spend, Save & Give. Each week, we go through our Responsibility Chart on the weekend (Sunday night) and we give our kids the money they earned & help them to figure out how much money goes in each envelope, so they are figuring it out on their own with a little help. Here are more details about each of them below. This is money that they can access at any time and they can bring this money with them anytime we go to a store or an activity where they might want an item from a gift shop, etc. This is very helpful as they know how much money they have and they can choose to use it however they want. It also eliminates the begging. I don’t know about you, but hearing kids whine & beg in the store for items would really frustrate me. Now, we let them know that if they want something, then they need to bring their money to pay for it. Often, my younger daughter would want to buy candy and even though this is not my choice for how she uses her money, it’s an important lesson for her to learn since candy is only a temporary treat. She has started learning to save her money a little more for items she wants to keep longer…although she still has her moments of wanting to buy that impulsive treat, so it’s still a learning process. My older daughter is definitely more of the saver & she sets her sights on more expensive items that she wants & tries to work towards those (although she still has her impulsive moments too). These are great teachable moments though where you can teach them about finding other options -maybe the cheaper candy or smaller quantity so they still have a treat but aren’t using up all their money, etc. You can also teach them about using coupons and shopping the sales, too. Gotta pass down the frugal tips for them! We require our kids to put at least 10% in the “save” envelope. They can choose to put more in here if they want, but the 10% is teaching them to always put some of their hard-earned money away in savings so they are building up their savings “fund”. We have certain times they can access their “save” account, especially around trips, special visits to the toy store, etc. If we have a trip coming up, a few times we have said that we would match the amount they put into “save” if they save a certain amount. For example, we took a long trip 2 yrs ago to the East Coast & knew they would want some spending money. In order to encourage them to save & not spend their money for a few months, we told them we would match their money if they saved at least $20 & we’d match up to $50. (They could save more than that, but that was the amount we would match up to). This worked very well as we let them know this would be how they would buy souvenirs on the trip – this account matching would be their opportunity to earn the most money to spend. They were so proud to spend that money on souvenirs on our trip, knowing they had worked so hard for several months to earn it. This envelope is to be used towards giving to others to encourage generosity, whether it be using it towards buying items to put into an Operation Christmas Child box or putting money in the Salvation Army boxes at Christmas, etc. Personally, we require our kids to put at least 10% in this envelope to teach them about biblically-based tithing and giving generously back to God to be able to bless others. Often times they want to give more than the 10%, especially as they have opportunities to see in action how their money can be used to bless others. This is our goal, to foster that generosity on their own, where they want to be generous & give to others from their hard-earned money. We’ve been using our Responsibility Charts & Money Management system for a number of years and it has been working well. This is not to say that it’s always perfect and it seems we’re often fine-tuning them, but our girls have responded well to them as they seem to like having the clear expectations laid out for them and knowing that they can earn money of their own when they work hard. We like that it gives them the opportunity to learn about saving & giving on their own and they get to start making money decisions early in life so they will hopefully be more careful with their money when they go out on their own. Have you tried any apps to track your kids chores? I wonder about the difference between a visual chart on the fridge vs the fun “gamification” of chores using an app. I think it would depend on the ages of the kids and what the kids’ interests are. I tend to go more digital by nature, but there is something to be said about old-school charts and the visual aspects of it. Just like the Dave Ramsey debt pay off progress poster. :) Keeps the goal front and center.